Engadget giveaway: Win audiophile-quality headphones courtesy of Sennheiser! Sennheiser has been a well-known brand in the “audiophile” headphone world for years and now its new closed back HD 630VB lets you take high-end quality on the road. The company built these closed ear cans with on-the-fly controls for controlling volume, skipping through tracks and dialing in low-end frequencies with its variable bass control. High resolution audio files should also get plenty of wiggle room with a 10 to 42,000 Hz frequency range. The exterior is crafted from light-weight aluminum, folds down to a compact size for portability and includes replaceable ear pads. This week, Sennheiser gave us a set of its HD 630VB for one lucky reader’s ears to cozy up with. All you need to do is head to the Rafflecopter widget below for up to three chances at winning. Winners will be chosen randomly. One (1) winner will receive one (1) set of Sennheiser HD 630VB headphones ($499.95 value). Entries can be submitted until June 8th at 11:59PM ET. Good luck! Vizio teased us with Google Cast-friendly soundbars back in March, and now the audio gear is up for sale. The company had already put the tech inside its TVs, so allowing you to beam tunes and other audio from a mobile device or computer is a logical addition. The SmartCast lineup starts at $180 for a 38-inch 3.0 Sound Bar and goes up to $500 for the 44-inch 5.1 Sound Bar and 45-inch 5.1 Slim Sound Bar options at the top end. That 45-inch model is the flagship of the group, ticking the tape at 2 inches tall by 2 inches deep to work alongside a 47-inch display. The 45-inch Slim Sound Bar also comes with two speakers for a surround sound setup and a 3-inch tall subwoofer that lies flat or stands vertically depending on where you want to put it. Inside, custom drivers crank out up to 104dB Sound Pressure Level (SPL) and 30 Hz of bass. There’s also a dedicated center channel to ensure any spoken dialogue remains crisp and clear. Unfortunately, Vizio didn’t go into much detail for the other models. All of the soundbars feature Google Cast though, making it easy to stream tunes from the library of apps that support the tech. There’s also a Vizio SmartCast app that controls the gear from an Android or iOS device and pulls in audio content from all of the services you like to employ. Like Sonos, Vizio’s SmartCast soundbars feature WiFi connectivity for streaming directly from the internet and offer multi-room options if you own more than one model. In addition to better audio quality, that WiFi connection also means that calls, texts and other notifications won’t interrupt whatever is playing over the speakers. Should the need arise, there’s Bluetooth connectivity on Vizio’s soundbars, too. The pricing is more affordable than Sonos and other Cast-friendly gear, arriving in a range of sizes to fit the TV you likely already have in your living room. What was once a test is now official. Twitter is rolling out a new version of its Android app which adheres to Material Design, the paper-like visual language developed by Google. The app is now split into four tabs — Home, Moments, Notifications and Messages — which you can move between by tapping the icons at the top of the screen, or using a horizontal swipe. Dragging across from the left-hand edge will reveal a side menu with shortcuts to your profile, lists and Twitter highlights. The drop-down arrow at the top of the menu will let you switch accounts, meanwhile. The visual revamp isn’t a huge surprise given how keen Google is for developers to embrace Material Design and its various principles. What is notable (but no less surprising) is the placement of Moments inside the new app. The feature is truly front and center now — an attempt by Twitter, no doubt, to make the news-centric hub more popular with users. What was once known as “Project Lightning” has had little effect on Twitter’s stagnant user numbers, but CEO Jack Dorsey will be hoping that can change now that it holds such a prominent place in the Android app. Juno is going where no spacecraft has been before. Launched five years ago, NASA’s solar-powered ship was sent on a mission to study Jupiter, the largest gas globe in the solar system. Now, after almost a couple of thousand days on course, it is going to arrive at Jupiter on the evening of July 4th to scan, measure, study and photograph the planet. On a recent trip to the Jet Propulsion Laboratory (JPL) headquarters in Pasadena, I caught up with lead project scientist Steve Levin for a rundown of the mission and the specific event that could potentially uncover the mysteries of the entire solar system. In the event, formally known as Jupiter Orbit Insertion (JOI), the 8,000-pound spacecraft will slow down as it approaches the planet so that it’s pulled into its orbit. Once inside, it will start circling Jupiter’s poles for insight into the composition of the planet and its magnetic fields. The tricky maneuver will bring Juno close to about 3,100 miles above the clouds, making it the ship that gets the rarest up, close and personal look at the massive planet. Juno being built at Lockheed Martin in 2011. Photo credit: Andy Cross via Getty Images. On the outside, the spaceship, built by Lockheed Martin, has a fan-like appearance with three solar panel extensions protruding from its main body. Inside, it’s loaded with gadgetry for the scientific mission. 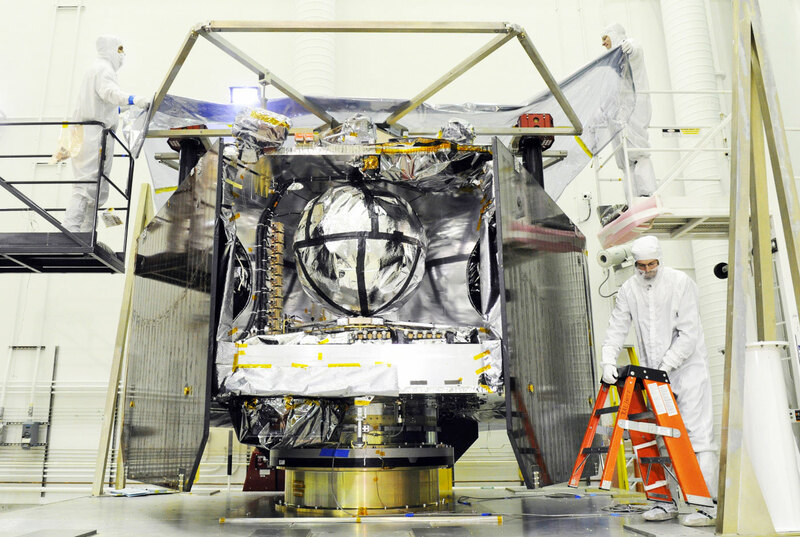 There’s a Gravity Science instrument that will map the planet’s gravity and magnetic fields. The Microwave Radiometer will check on how much water is on the planet. There’s also a JunoCam to photograph the planet. The information from the instruments will help scientists learn how the massive planet was formed. Does it have the same composition as the sun? Or is it made up of large chunks of ice? Firing up the sensors at a planned precise moment will reveal the answers next month. This post was done in partnership with The Sweethome, a buyer’s guide to the best things for your home. Read the full article here. After putting in 70 hours of research over the past two years, we’ve learned that pretty much any dishwasher can get your dishes clean when you use it properly. But we think paying a bit more for a machine that’s practically inaudible and easier to load is a worthy investment. That’s why we think the Bosch 500 Series is the best dishwasher for most people. One of the most affordable dishwashers with a third rack, it offers as much capacity and loading flexibility as models that cost a few hundred dollars more. We sought out models with the most flexible and intuitive racking options, as well as whisper-quiet operation and a reputation for reliability. The sweet spot for price is around $800 to $900. Dishwashers in this range are quiet, efficient, effective, and easy to load with lots of dishes of all shapes and sizes. 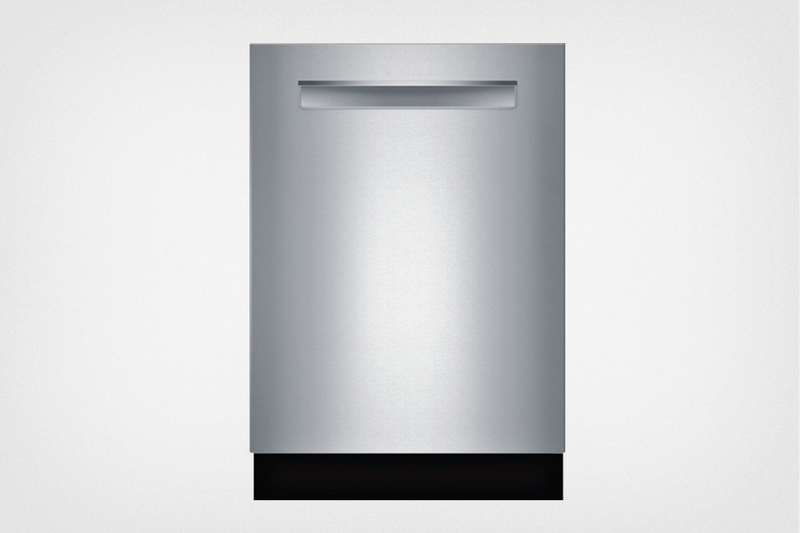 Higher-end models don’t have many practical advantages over midrange dishwashers. Yes, expensive models are quieter, but midrange models are barely audible anyway. Going into this guide, we knew we wouldn’t be able to test any dishwashers firsthand because we don’t have a testing facility. So, instead, we relied on reporting. We talked with a handful of experts from different parts of the industry. User reviews and comments were also a big part of our research. We also got some hands-on time with a few models at appliance showrooms in the Boston metro area, including Home Depot, Lowe’s, Sears, and Yale Appliance + Lighting. This process helped us get a feel for each machine’s loading flexibility. To confirm our findings we consulted Reviewed.com and Consumer Reports—two entities that conduct extensive in-house performance testing—for published reviews of our favorite models. Minimalist design, minimal noise levels, and maximum capacity and versatility make the Bosch 500 Series our pick for the second year running. 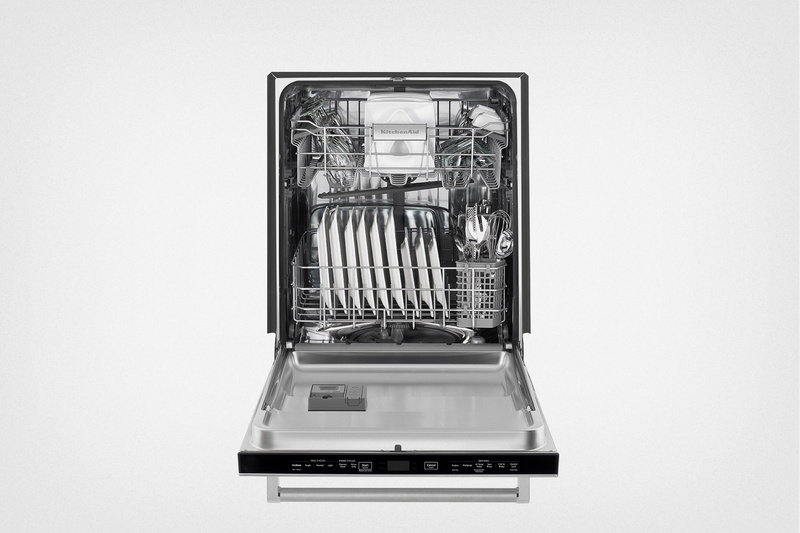 The Bosch 500 Series is the best dishwasher for most people because it has the most flexible, capacious, and easy-to-load racks for the money; it also runs so quietly that you can barely hear it, and the company has a years-long track record for reliability, with a better-than-average warranty and service network. This model is both water- and energy-efficient, and it cleans as well as any top-tier dishwasher. The feature set is right on the sweet spot, as every feature is helpful, without any bloat to drive up the price. Winning features of the KitchenAid KDTM354ESS include its no-maintenance filter system and traditional heat-dry option. The KitchenAid KDTM354ESS is another quiet, efficient, and overall excellent dishwasher, yet it was made in a different style than our top pick. The main differences include a heat-dry option, a self-cleaning filter, and a power-washing zone that’s handy for loading large pans and casserole trays. In some situations, this model might be better at cleaning sticky, starchy food deposits, too. Its drawbacks? This KitchenAid dishwasher lacks a third rack, so it fits fewer dishes. It’s also a newer model, so we don’t have a clear picture of its reliability. The Maytag MDB4949SDx has an all-stainless steel tub that helps it run more quietly than competing models at its price. It also has a fantastic average user rating across more than 10,000 reviews. If you’re on a tighter budget, or if you prefer a more traditional American-style dishwasher with a heated dry cycle and a food grinder, the Maytag MDB4949SDx is the way to go. It’s one of the few dishwashers at such a low price with a stainless steel tub, which helps the machine keep the volume down and dry dishes more efficiently than dishwashers with plastic tubs. It has some of the best user ratings of any dishwasher at any price, including positive notes about reliability. Compared with our main pick, this Maytag holds fewer dishes, uses more energy, runs louder, and takes longer to finish its cycles. But it’s an excellent choice for the money. 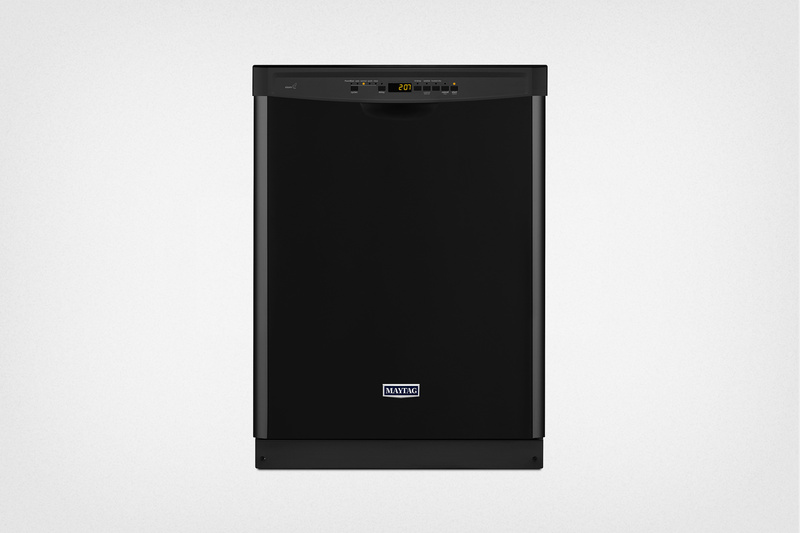 If your kitchen can’t fit a standard 24-incher, but you still want a built-in dishwasher, check out the Bosch 800 Series SPE68U55SS, essentially an 18-inch version of our main pick. Obviously it can’t hold as many dishes as its larger cousin, and it has no third rack. But the racking system is as flexible as you’ll find in this category, and it cleans well and runs quietly. 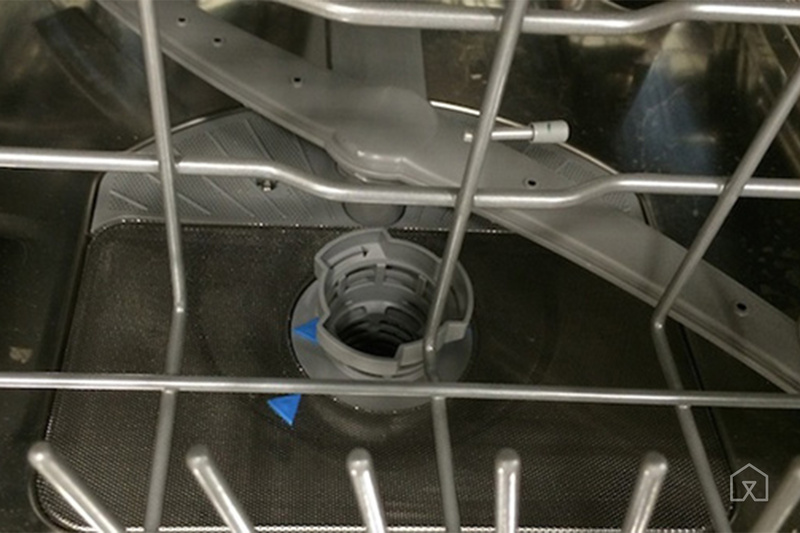 The 500 Series (as well as most other dishwashers today) captures food waste in a mesh filter. You should rinse it once a month to clear any built-up gunk. If your new dishwasher isn’t working well or seems to be giving you trouble, try to tweak your habits before blaming the machine. Dishwashers and detergents don’t work like they used to, and old methods don’t always do the trick nowadays. Modern dishwashers work only when they have dirty dishes in them. You don’t need to prerinse your dishes anymore. Seriously, you shouldn’t prerinse. Enzymes in detergents are basically inert until they come into contact with organic matter—that is, the dried marinara, globs of mustard, and bits of spinach stuck to your plates, bowls, and forks. So when your dishes are dirtier, more of the detergent activates faster, and the process of actually cleaning the dishes (rather than just getting them wet) begins sooner. But if your dishes are mostly clean at the start of a cycle, the detergent may not fully activate, and any residue may stay stuck on the dishes. Next, you need to load the dishes in the proper parts of the racks. If you position dirty surfaces away from the wash arms or nest them too closely together, they won’t get clean. If that doesn’t solve your problems, try switching detergent or using a different amount. And always use rinse aid. Every new dishwasher has a rinse-aid dispenser because rinse aid is essentially mandatory if you want your dishwasher to work well these days, according to every industry person we talked to. You’ll need to do a bit of low-effort upkeep a few times a year, such as cleaning the filter, to maintain the machine’s washing performance and prevent odors, too. (More on this in our full guide.) 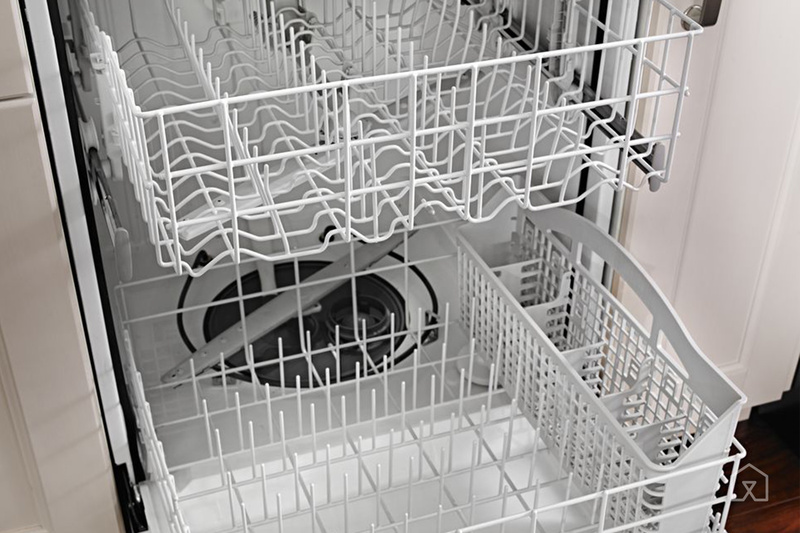 The good news is that once you get your new routine dialed in, you should be putting less effort into using your dishwasher than ever before. XCOM 2 hit PCs earlier this year, and in September you’ll be able to play it on those current-gen consoles. After some indications that the game wouldn’t make the leap to PS4 and Xbox One, 2K is set to release the title in North America on September 6th with a global launch to follow on September 9th. Two DLCs have already been released for the PC version, including a truckload of new gear for the soldiers and the addition of three new Ruler alien enemies. If the PC-only comments had you down, don’t fret: you’ll be able to take command at the end of the summer on the console of your choice. Nissan’s luxury Infiniti brand has its sights set on self-driving. Speaking at an automotive conference in China this week, Infiniti president Roland Kreuger announced plans to integrate highway self-driving in newer models, Reuters reports. At this point, only the Q50 sedan has the necessary steering technology to enable the feature, but Kreuger says the company plans to bring it to new cars on an individual basis. “Whenever we are launching the next cars with such a steering system or the next generation of these systems, then of course we would offer those features to our customers,” he said. When it comes to delivering autonomous driving outside of highways, Kreuger says they’ll have to wait for new infrastructure and approaches to regulation. While some luxury car brands already allow for some assisted driving features, like lane-correction and automatic breaking, only Tesla offers autonomous driving on highways at the moment. Microsoft recently announced that it will be holding an afterparty at WWDC this year, taking place next week on Monday, June 13 following Apple’s State of the Union keynote (via WinBeta). In partnership with its software-focused company Xamarin, Microsoft’s party is centered around “The Future of Apps,” and is confirmed to last from 5 PM to 8:30 PM PDT, located in Twitter’s headquarters near the Bill Graham Civic Auditorium. Any iOS and OS X developer is welcome to attend Microsoft’s party, even if you aren’t directly attending WWDC, and the company is also giving anyone who checks in a chance to win either an Apple Watch Sport or Xbox One every hour. Microsoft hopes to discuss the latest iOS apps and updates created by the company at the event — everything from Outlook to Excel and SwiftKey apps for iPhone and iPad devices — including their future on the platform. Likewise, Xamarin’s inclusion in the afterparty will generate some talk surrounding its Test Cloud platform, which lets developers run and test every feature of their apps “on more than a thousand devices,” without having to worry about inconsistencies fragmenting data due to different smartphone designs and OS interfaces. The company’s tools in the past have helped developers design apps for iOS, Android, and Windows platforms. Xamarin Test Cloud lets teams test every feature on more than a thousand devices and on every commit. Catching bugs before release shortens development cycles and allows more time for innovation. We’ll also be offering exclusive one-on-one time with a Xamarin Test Cloud Engineer to walk you through the best way to automate testing on your apps. Any developer interested in attending Microsoft and Xamarin’s WWDC afterparty can RSVP to the event here. Apple Pay will expand to Switzerland on Monday, June 13, marking the seventh country where the mobile payments service is available, according to German-language financial website Finews (via iPhone-Ticker). Swiss private bank Cornèr Bank will purportedly be one of the first participating issuers in Switzerland, but the report did not specify if the country’s two “big banks” UBS and Credit Suisse will also support Apple Pay upon launch. Apple Pay’s arrival in Switzerland has been expected since Apple filed a trademark for the service with the Swiss Federal Institute of Intellectual Property in February. The U.K. is currently the only other European country with Apple Pay. Apple is “working rapidly” to expand the service to additional regions, including Hong Kong and Spain, and possibly France, Brazil, and Japan, in partnership with American Express, MasterCard, Visa, and other payment processors. Apple Pay has also expanded to ANZ in Australia, five large banks in Singapore, and Canada’s big five banks BMO, CIBC, RBC, Scotiabank, and TD Canada Trust. Apple today seeded the second beta of an upcoming iOS 9.3.3 update to public beta testers, one day after seeding the second iOS 9.3.3 beta to developers. iOS 9.3.3 has been in testing since May 23 and comes three weeks after the release of iOS 9.3.2, an update focusing primarily on bug fixes. Beta testers who have signed up for Apple’s beta testing program will receive the iOS 9.3.3 update over-the-air after installing the proper certificate on their iOS device. Those who want to be a part of Apple’s beta testing program can sign up to participate through the beta testing website, which gives users access to both iOS and OS X betas. As another minor 9.x.x update, iOS 9.3.3 includes under-the-hood bug fixes and performance improvements to address issues that have been discovered since the release of iOS 9.3.2. No outward-facing changes or immediately apparently bug fixes have been discovered in the first two developer betas of iOS 9.3.3.